One of the benefits of being a game reviewer is being able to play all sorts of games pretty much every day and be able to say “hey, it's my job - not play!” and actually get away with it. As a result though, you tend to get to know pretty much every genre and sub-genre. Well, almost. I say almost because every now and then you get surprised by a game that does not actually fit into any of the core genres. This is just such a title. 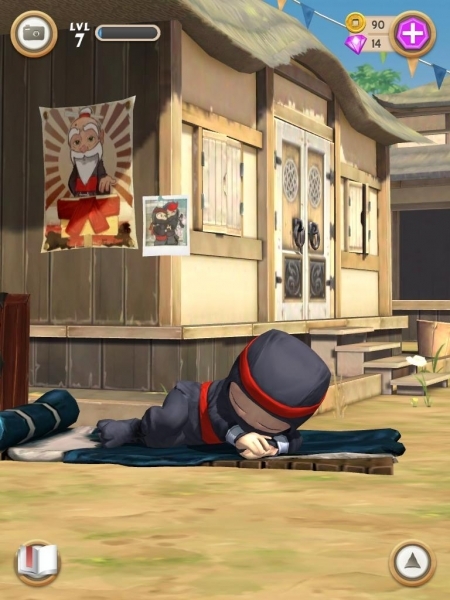 Clumsy Ninja is certainly a game - there is no doubt about that and no denying it - but it might also be called a simulation. 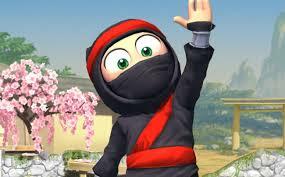 The best description that I can give it is to say that it is a Ninja Simulator with a definite story to it. 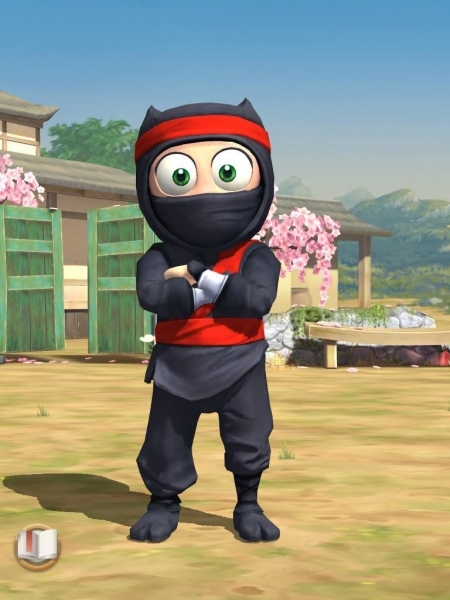 You begin playing with a raw recruit Ninja - a young but eager student of the Ninja arts who lacks pretty much any skills and who your basic task from the start is to train up properly. What does that mean? Well, it means just what it sounds like. You begin by teaching him how to fall, jump, hit, and run around. 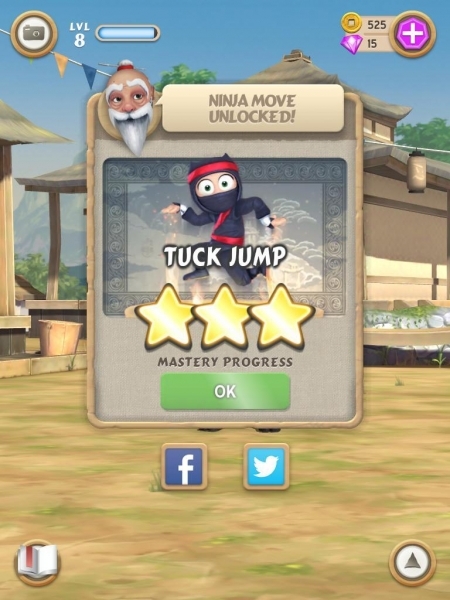 Using training props allows you to help your Ninja recruit level up - and it is about leveling up. 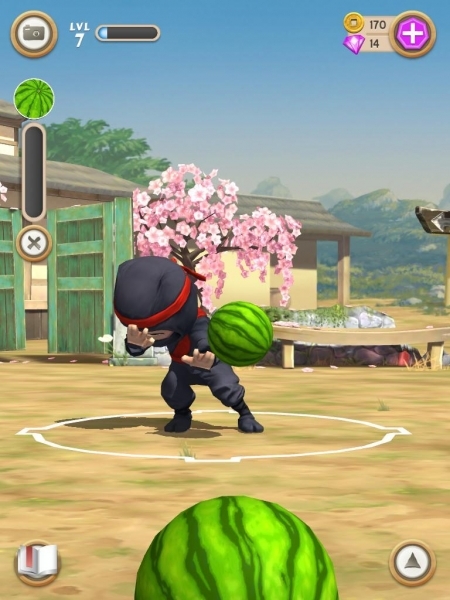 Like a lot of games these days, the wizards behind Clumsy Ninja opted to make use of the built-in hardware for the device - in this case the cameras - allowing the player to pose for pics with their Ninja, and how cool is that? As is usually the case with a freemium title - even one as strange and interesting as this one - it includes a mixture of ad videos and in-game purchases as its revenue stream. With respect to in-game purchases, these are divided into two primary Premium Currency objects: Gems and Coins. Pricing ranges from $2.99 to $29.99 - or FREE if you are willing to watch advertising or download other games and apps, take surveys, or make online purchases. It bears comment that both the Gems and Coins can also be earned in-game (but at low volume) so in theory you do not actually have to pay real-world money to buy it in-game unless you want to. The outright ads tend to be for other games in our experience - which when you think about it is not so bad a deal considering that a lot of freemium titles have far more aggressive ad programs. The actual game play is far more interesting than it sounds when you read a simple description - after all you have to be wondering how much fun can it be to train a Ninja? Well as it turns out, a lot! A variety of props are available - but of course you have to earn either Gems or Coins in order to buy them. Once you do, each of the props offers you a range of XP to be earned through their use - some of them being rather amusing in their own right. There is the Trampoline, Soccer Ball, Basketball Hoop, and Rice Sack Punching Bag to start out with, and as you level up a wider selection of objects suitable for training purposes become available. The graphics in this one are part of the surprise - as the anime style presentation not only looks good but works really well and smoothly, which is not always the case when the wizards behind a game go for a slick and glowing presentation. The music and sound is pretty average but has just the right flavor for the game and its theme. So hey, win-win-win! While we like the game, and find it entertaining, the agressive use of advertising in the game caused us more than a little irritation. That being so, it cost the game a full point. The use of overly long timers to recharge item repair also left us a little cold - but when we dismiss (note we did not say excuse) these issues, we still found it earned a solid 3.5 and our consideration as a worthy play. The #1 virtual world for kids comes alive ..